BBC Sport rounds up the Africans scoring goals in the major leagues around Europe and in China. Carl Medjani opened his account in Ligue 1, scoring his first goal to give Ajaccio the lead in a 2-0 win over Evian TG. The Algeria midfielder struck in the 20th minute to help Ajaccio secure their second win. Burkina Faso midfielder Alain Traore made up for his penalty miss in the first half to score Lorient's third goal in the 3-0 home win over Nancy. Traore was on target with five minutes remaining to help his side move up to third position. 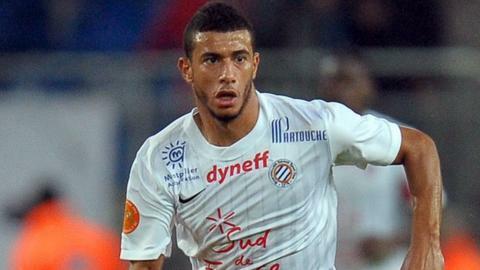 Morocco striker Younes Belhanda, however, converted without any difficulty from the penalty spot in the 16th minute to help league holders Montpellier win their first game of the new season by beating Sochaux 3-1. Pierre Aubameyang scored Saint Etienne's second goal as they triumphed 3-0 away at Bastia. The Gabon striker has now scored three goals in in four games. Tunisia defender Aymen Abdennour put the ball in the back of his own net to put his side Toulouse behind against Reims but he was rescued by a late equaliser that meant his side took a point from a 1-1 draw. Mali's Mahamane Traore pulled off a dramatic added-time equaliser for visiting Nice who had conceded in the 86th minute to 10-man Bordeaux. Senegal defender Ludovic Lamine Sane had been sent off for Bordeaux in the 64th minute. Cameroon defender Alain Chedjou was on target with a 12th-minute equaliser for Lille who lost 2-1 to visitors Paris Saint-Germain. Liban Abdi Ali made history at the weekend by becoming the first player from Somali to score a goal in Portuguese top-flight football. The 23-year-old, in his first season at Olhanense after transferring from Hungarian side Ferencvaros, scored the opening goal but his side lost 3-2 to Porto. Senegal defender Mahamadou N'diaye sparked a comeback for Vitoria Guimaraes after he scored in the 82nd minute to help his side draw 2-2 with Estoril. Tunisia defender Karim Haggui became the first African to score in the Bundesliga this season when he gave Hannover 96 the lead in their 4-0 triumph away at Wolfsburg. Haggui, who is playing in his seventh Bundesliga season, broke the deadlock in the 10th minute to give Hannover their first win. He was the only African player on target in the German top-flight at the weekend. Morocco striker Abdelaziz Barrada proved his worth again for Getafe after he equalised in the 26th minute in their 1-1 draw away at Deportivo la Coruna. Barrada scored the winner against Real Madrid in a 2-1 win last weekend. Alex Song played his first game for Barcelona against Valencia since the Cameroonian midfielder moved from Arsenal last week. He played the entire game as Barcelona edged out Valencia by a lone goal on Sunday. Morocco midfielder Adil Ramzi and Egyptian striker Sanharib Malki were both on the scoresheet for Roda who beat 10-man Willem II 3-0. Ramzi scored Roda's second in the 81st minute after Malki had given his side the lead before half-time as both players helped to secure their side's first victory of the season. Vitesse Arnhem climbed to second place in the table after a last-gasp winner over giants Feyenoord. Ivory Coast striker Wilfried Bony was the hero as he scored the lone goal in the first minute of added time. The Eredivisie weekend concluded in what was an eventful evening for South Africa midfielder Thulani Serero. He struck two goals before he was sent off in the 53rd minute but his side Ajax held on for a 2-2 draw with Heerenveen. Nigeria striker Kalu Uche pulled of the best African performance in the Super Lig with a hat-trick for Kasimpasa who beat Elazigspor 3-0. Uche scored one of his goals from the penalty spot as Kasimpasa moved up to second position. Diomansy Kamara scored twice in Eskisehirsports' 3-1 win over Mersin idmanyurdu. The Senegalese striker put Eskisehirpsor ahead in the opening minute of the game before making sure his side took home all the three points in added time. Antalyaspor held on to a 10th-minute lead given to them by Nigerian Isaac Promise to beat Istanbul BB 1-0. Guinea striker Ibrahima Conte put Gent in the lead early in the second-half in his side's 1-1 draw at Charleroi. Cameroon striker Aloys Nong scored twice to help Mons beat Zulte-Waregem 4-2, while Senegal striker Mbaye Leye had pulled a goal back for home side Zulte-Waregem in the 76th minute from the penalty spot. Another Cameroon striker Christian Pouga scored after four minutes of added time to secure the points with his last-gasp equaliser for Leuven who drew 1-1 with Lierse. Burundi striker Mohamed Tchite was one of the goal scorers for Club Bruges who outclassed Standard Liege 4-2 in one of the league's biggest derbies. Terek Grozny's Chadian striker Ezechiel N'Douassel scored his first goal of the season after giving his side the lead in a 2-1 win over Rubin Kazan. Moscow giants CSKA moved to third in the table thanks to their Nigerian striker Ahmed Musa who scored the only goal of the game against Krasnodar. Behind CSKA Moscow in fourth position are Anzhi Makhachkala who beat Krylya Sovetov 2-1. Goals by Congo defender Christopher Samba and Ivory Coast striker Lacina Traore were enough to give Anzhi Makhachkala their second win in a row. Senegal striker Dame Ndoye equalised for Lokomotiv in the 60th minute as they came from behind to beat city rivals Spartak 2-1 in a Moscow derby. Ghana striker Dominic Adiyiah ended his goal drought by scoring the only African goal in the Premier League after coming on as a second-half substitute to help Arsenal Kyiv beat Metalurh Zaporizhya 3-0. It was Adiyiah's first goal in a league game in three seasons. Rafik Djebbour scored a goal in each half to help Olympiakos beat Levadiakos 4-0. The Algeria striker is the Super League's top scorer with three goals after two games. Zambia captain Christopher Katongo converted from the penalty spot to give Henan Jianye the lead shortly after half-time as his side beat Shandong Luneng 2-1. Only three games were played over the weekend. Yaya Toure gave Manchester City the lead in the first half, sending the Premier League champions on their way to a 3-1 win against QPR. The Ivorian scored through a crowd after QPR failed to clear a corner they had contested.